We know the value of early intervention in helping a student stay successful. Microsoft is using the power of predictive analytics and Microsoft’s Modeling tools to create a readily-available and reliable student information solution that can help warn administrators and educators of students who may need assistance. Learn how Aptude, a Microsoft Gold Partner, can help you get started in using this highly-dynamic and student-impactful tool. Every 26 seconds, another student drops out of high school. We can help fix that. Predictive Analytics can help identify at-risk learners earlier. This Smart Reporting System provides a clearer understanding of why they are struggling, making it possible to implement programs and interventions that positively impact their learning experience. We can change the trajectory of struggling students with tools that support teachers in the classroom and provide them with actionable information. Let Aptude be your technological gateway to implementing these essential services. Using student analytics to manage & measure performance ensures that students stay on the right path to achieve more. Teachers, school leaders, and parents can ensure that students stay on track a number of different ways. Student analytics are useful tools to inform teachers what to do next. It allows a teacher to customize the support they give each student based on real time predictors and indicators. K12 Smart Reporting Systems can help improve the performance of not just at-risk students, but all students. Student analytics is the process of understanding the complete performance of all your students. With student analytics, you can identify performance gaps, view grades, and assess scores and attendance records in order to identify underperforming students. Student analytics can predict dropout profiles as well as academic excellence indicators. It can also show teachers who might be likely to struggle in different academic areas and which concepts a student has mastered. From year to year, student profiles can be used to track their progress and immediately intervene if a problem occurs. Strategic Minded Educational Districts need coordination, visibility, clarity, and accountability around their district’s and school’s performance. 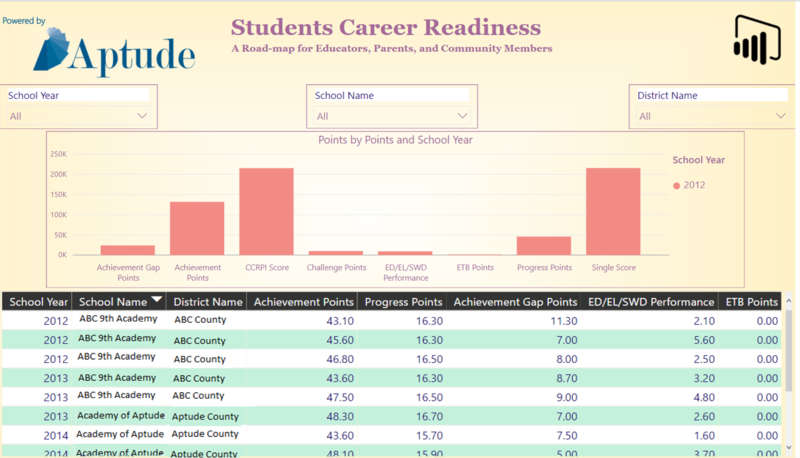 By using our CCRPI Dashboards, schools can review and understand the data that may affect change and measure progress. 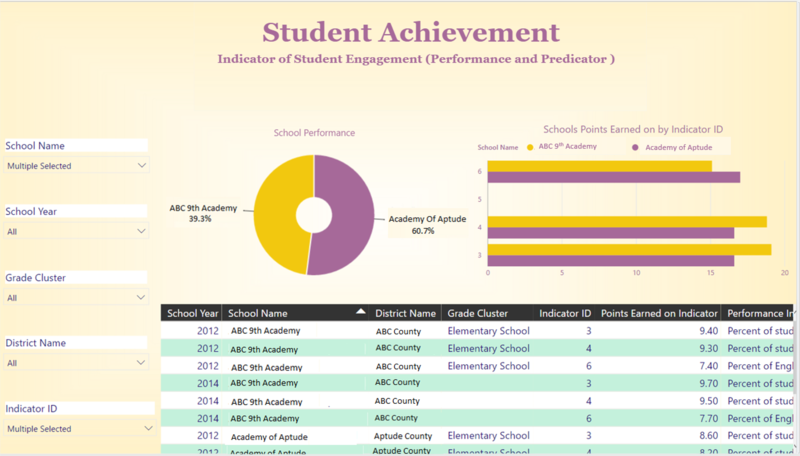 By using our dashboard, stakeholders in the school community can consistently monitor opportunities and performance and compare itself against other schools and districts. Student analytics is a rich fountain of information. Guided by enhanced insights on student performance, teachers and administrations can implement a culture of data-driven decision making to better improve the school and the learning experience. A data-driven environment gives teachers the necessary information to personalize their learning approach for each student. This can improve both the students’ achievement rates and their overall education experience. Teachers can also experience success with higher levels of collaboration and better teacher/student engagements. Everyone feels more confident when decisions are made based on readily-available and reliable student information. Also, more timely interventions can lead to more effective student advising at the time of greatest need. Overall, the educational excellence of the school dramatically increases. Custom programs can increase the ability to stage early interventions, keeping students on track while also helping teachers reduce reporting times and promote their professional development and success. Analytics can help your school improve students’ scores and retention rates.